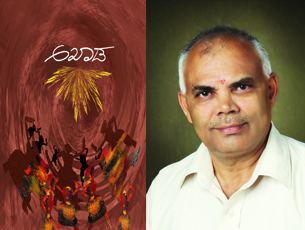 Mangaluru, May 21, 2015: ’Akhaada,’ a collection of poems by former Mangaluru International Airport Director M R Vasudeva, published by Marpalli Prakashana will be released on May 23, 2015 at Subrahmanya Sadana at Jail Road, Kodialbail, Mangaluru at 10.30 am. Addressing media M R Vasudeva said that the event will be presided over by Dharmashala Dharmadhikari Veerendra Heggade. All India Radio, Mangaluru, Assistant Director Vasanthkumar Perla, lawyer and director of IAS coaching centre, Shivamogga, M R Sathyanarayan will be the chief guests for the programme. Vistar (Bengaluru) Trustee R Gopalakrishna and Kannada Sahitya Parishat former president Harikrishna Punaruru will be present. The poems will be sung by artistes, at the book release. Assistant Director of Marpalli Prakashana Ratna Vasudev, Sudhakar Rao Pejavar and others were present.